What does the Kidron Brook have to do with me? The story from 2nd Samuel about King David's escape from Jerusalem when Absalom tries to supplant his father as king has deeply moved me during my last two read-throughs of the scriptures. But since last week the same passage has been caught in my heart and I feel compelled to share about it. Among the several dark moments of David's life, this may have been one of the darkest. But the pain and anguish for himself and his faithful followers point towards future events and a coming glory that is as staggering as it is profound. In 2 Samuel 15, verse 23 says, "And all the country wept with a loud voice, and all the people crossed over. The king himself also crossed over the Brook Kidron..." And in verse 30 we read, "So David went up by the Ascent of the Mount of Olives, and wept as he went up; and he had his head covered and went barefoot. And all the people who were with him covered their heads and went up, weeping as they went up." David flees not only for his own safety but also to preserve lives of all that remain in Jerusalem at the time. Rather than fighting to defend his rightful place, he humbly accepts his defeat and leaves. He seems to recognize the strength of human connivance and politicking and turns the other way. One thousand years later a remarkably similar story takes place in John 18:1-2. "When Jesus had spoken these words, He went out with His disciples over the Brook Kidron, where there was a garden, which He and His disciples entered. And Judas, who betrayed Him, also knew the place; for Jesus often met there with His disciples." Jesus too recognized that the very human religious "powers that be" had it in for Him, and humbly conceded what was a temporary "defeat" at Calvary. And in so doing He established the glorious and eternal Kingdom towards which David and his kingdom had pointed. He also shed his tears over this same city. We read in Luke 13:34, "O Jerusalem, Jerusalem, the one who kills the prophets and stones those who are sent to her! How often I wanted to gather your children together, as a hen gathers her brood under her wings, but you were not willing!" And again in Luke 19:41-42, "Now as He drew near, He saw the city and wept over it, saying, 'If you had known, even you, especially in this your day, the things that make for your peace! But now they are hidden from your eyes.'" I think what has most deeply affected me in these portions is something that applies to the situation in Christendom today. The organization and procedure of much of the church has tended to limit the active participation of the Holy Spirit in its operations for "practical reasons." These might include keeping to schedules and timing, not wanting to discomfort people by taking too much of their time, etc., etc. But over the years these very institutional considerations have produced another "Kidron Brook" over which the Holy Spirit has been obliged to sorrowfully cross, not unlike David or Jesus in their times. One result is that a great many of the traditional churches have shrunk in numbers, and many have closed altogether. There are many others which become evident as we pray and think about this. To bring this a little closer to home, I know there are parallels in our own lives as well. Each of us in our personal organization of our time and activities have to make practical choices. Are we making time for the Holy Spirit in prayer and in study of the word? Are being sensitive and obedient to His leadings? Or are we unknowingly allowing "Kidron Brooks" to form in our own lives? I just want to put this out there to encourage us in keeping our "houses" in order. I also want to encourage you to pray that there would be a massive reversal of this trend - that any and all "Kidron Brooks" would be replaced by Rivers of Living Water! And also pray that in our times we would see more and more of God's direct intervention in the lives of men and nations around the globe. The River is rising, and so is the need. May the Lord bless you with the fullness of the Holy Spirit, and discernment and perseverance for the exciting race that lies before us! P.S. The book The Revival We Need which I quoted last month is available to read online here, or can be downloaded as a .pdf file or an .epub file. 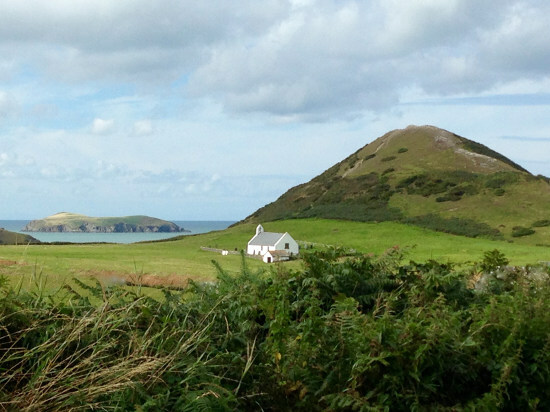 This little chapel at nearby Mwnt dates from the 14th century, but the site itself has been used as a place of worship by the Celtic saints since nearly 800 years earlier. 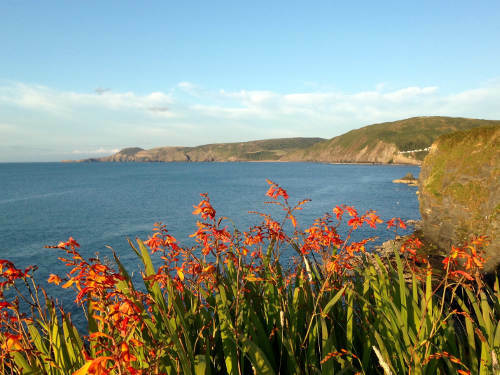 An unobstructed view of Cardigan Island enhances the natural beauty of the place, and just over the brow of the hill is a small sheltered beach, making it a popular spot for tourists and locals alike. 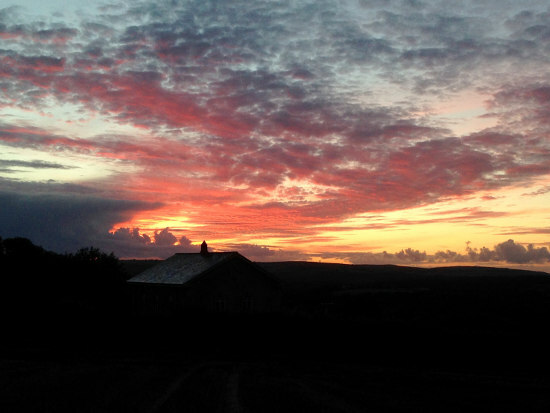 We like to bring visitors here because of the wonderful views from the hilltop overlooking Cardigan Bay and the Irish Sea. On clear days you can see the mountains of North Wales and so it is a great place to pray for the nation. The first half of September has just flown by, filled with activities and visits. We spent the first half of last week with our friends Qday and company in Llanelli to attend some special meetings, including the first part of the Wildfires Revival Conference put on by a church in North Wales. 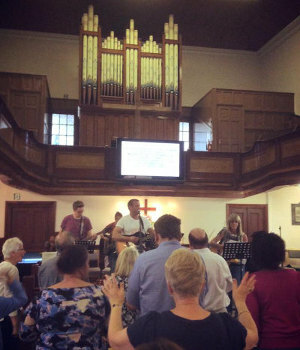 The Tuesday evening meeting took place in an old baptist church in Briton Ferry, and was certainly a move away from the traditional services and surroundings. A group of pastors from Brazil had been invited to minister in the conference, and it was a lively and powerful time. 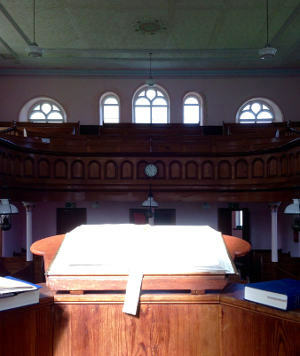 Then Wednesday morning the second conference meeting took place at Moriah Chapel in Loughor. We were joined there by other groups from Korea and India. Both nations had been touched by the Gospel as a direct result of the Welsh Revivals of 1859 and 1904. So there was a deep crying out for another revival to come awaken this nation again, amidst a profound gratitude for the "fire of God" they had received so many years before. It was a very international group and a wonderful time of prayer in many languages. 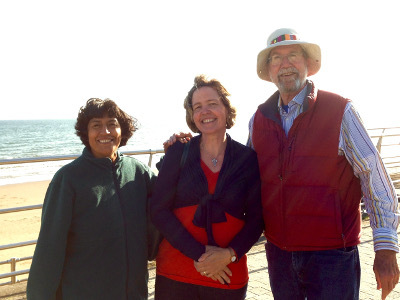 We were invited to these meetings by our friend Sue from Berkshire in Southeast England who we've known now for a few years. She has been involved in some specific prayer missions into Wales, Scotland, Ireland and even the USA. It was great to spend some time together and admire how the Lord continues moving and connecting people of prayer in so many amazing ways. We couldn't help but enjoy the surprise that her hotel booking fell through and so she wound up staying with us in our friend's house. And there she met again with Brenda, our intercessor friend to France who she "just happened" to stay with in our house unexpectedly two years ago! On Monday afternoon we went to a very interesting talk given at the Bible College of Wales (BCW) in Swansea by an Israeli diplomat stationed in London. And then on Wednesday afternoon, after the group from North Wales went home to continue their conference in Colwyn Bay, there was another special meeting at the BCW with Rick Ridings of Succat Hallel. This is a 24 hour worship and prayer center in Jerusalem that he and his wife Patti started there in 1999. Interesting, that's the same year the Lord showed me the vision of the coming Welsh Revival, and the same year that 24/7 prayer started, both independently, Kansas City and London! Rick told a little of their story, shared some lessons learned about prayer, and gave some wonderful testimonies of the amazing ways the Lord has guided them in specific directed prayer. His word was a great exhortation and encouragement not only for us here in West Wales and other intercessors present, but also to the College itself which, under the direction of Rees Howells at the time, had a phenomenal impact on the course of World War II also through directed prayers. 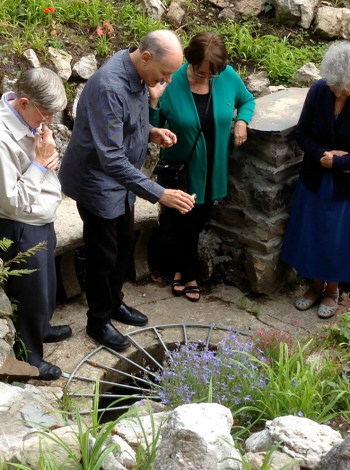 At the end of the meeting, we all went out into the gardens where some powerful prayers were said and olive oil from Israel was poured into an old well that was uncovered during the recent renovations. You can see a video clip here. 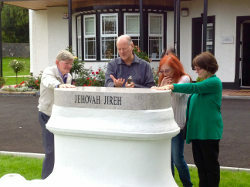 They also anointed the plinth that carries the well known faith declaration of Rees Howells, "Jehovah Jireh!" What a blessing to see the fulfillment of these words at the College today - renewed in every way by God's amazing provision! When we came home again on Thursday we brought an extra blessing with us. Our young Korean friend Joosun came with us to spend the weekend. We've known her since the first Forge School of Fait h in December of 2012, and she has been a part of the schools and community there in Llanelli that is directed by our long-time friends Qday and Bridget Lee. It was a blessing to have time to share some of our story of faith adventures with her, and spend some timing praying with her in the chapel. A special time was visiting our friend Moira on her dairy farm. 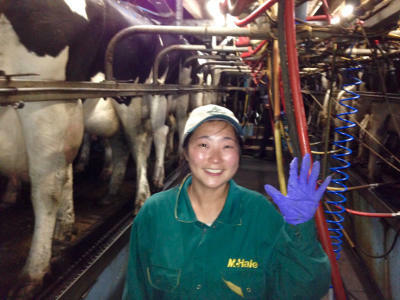 Joosun was raised in a rural farming community in Southeast Korea, but had never been around a dairy, so was delighted to get into the action helping milk the cows. Sunday we took her to Mwnt to climb the "mountain" by the sea with Gladys, in the top photo. It was a joy to have the company of another young person who is surrendered heart and soul to the Lord and has dedicated her life to His service. Her time here in Wales is coming to a close for now, and she is headed back to her homeland with missions, and Wales, on her heart. Please join us praying for her that the Lord clearly guide her steps as she seeks God's plan for her life. Thank you for your continued interest, and especially for your prayers for Wales and for the nations. May God's grace and wisdom empower your prayers for these needy times in which we live.